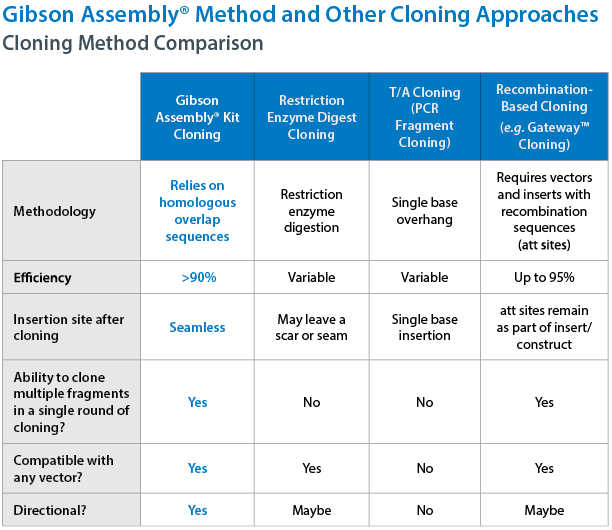 News and Events: How Does Gibson Assembly® Cloning Compare to Traditional Cloning Methods? Cloning has evolved since the early 1970s, when John F. Morrow and Herbert Boyer first cloned eukaryotic genes into bacteria. This technology has enabled scientists to discover entire genetic sequences of many species and pharma to develop life-saving drugs, such as insulin, clotting factors, and human growth hormones using cloned genes. While there are multiple cloning methods now in use, here is a brief compilation and comparison of some commonly used approaches. Restriction enzyme digest, a classic method, that uses an endonuclease to cut DNA at specific sequences. The enzymes cut double stranded DNA into fragments, allowing for two pieces of DNA can then be fused together during a ligation reaction. Recombination based cloning or Gateway™ cloning uses recombination sites to insert DNA into a vector. The reaction moves a piece of DNA from one plasmid into another and is done via a single recombination reaction. TA cloning (PCR fragment cloning) with Taq polymerase leaves a single adenosine (A) overhang on the 3' end of PCR products. This cloning method requires a cloning vector modified to have a T or a U residue on its ends. Gibson Assembly® Method (isothermal assembly) is a technique that uses overlapping ends to allow for the rapid and seamless insertion of multiple DNA fragments into a plasmid DNA vector. Cloning methods are distinguished by many different features. The chart below details the cloning methods vary by methodology, efficiency, insertion site, ability to clone multiple DNA fragments at a time, vector compatibility, and directionality. 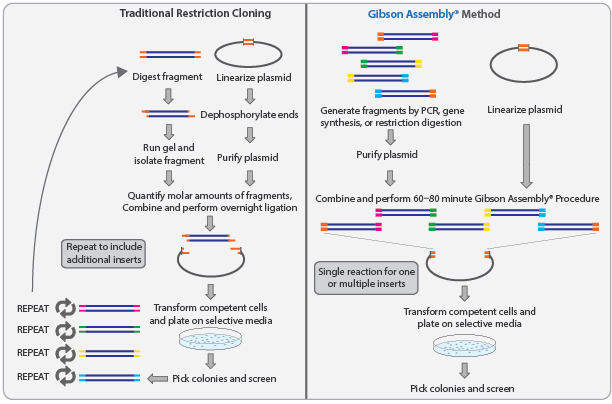 While each method has its benefits for various workflows, the Gibson Assembly® method provides the most comprehensive set of advantages over the traditional cloning methods. For example, Gibson Assembly® method can be used for simultaneous assembly of multiple inserts and offers substantial time-savings for multiple insert assembly projects. The figure below illustrates how Gibson Assembly® Method is faster and more efficient than traditional approaches. Visit SGI-DNA's webpage to learn more about Gibson Assembly® kits and download an electronic version of SGI-DNA's Gibson Assembly® Guide to learn about all the ways you can get #DNAMYWAY. Gateway™ is a trademark of Thermo Fisher Scientific. Gibson Assembly Assembly US Patent Nos. 7,776,532, 8,435,736, and 8,968,999. The traditional methods for making a high quality cloning rather than the other available cloning methods.There are many people who like t have this pinoyminimalist.com for learning more details about the tradition cloning system compared to the assembly cloning system.The specific order and code will show the specific project for the attainment of the target and goal of the project. There are several types of corporate events NYC. They can be formal or informal, and can be exclusive or open to the public such as a fundraising event. Such advents are generally held to revive a corporation and to build relationships with the key players in business. Restriction enzyme digestion and ligation are considered as a traditional method of cloning. Gibson Assembly is a method of cloning seamlessly. And blunt-end-clonings is a third method by which DNA fragments can be cloned into a plasmid vector.